In an earlier post I wrote about how I met Tony Viramontes . This is the second part of the story. It was the early 80’s. Tony Viramontes was 27 years old when he arrived in Paris, and I was a few years younger than that . I had not grown up in an urban environment as opposed to Tony who was very inspired by the 80’s club scene and the larger-than-life characters that inhabited it. Many of the portraits he did at the time were of terrifying, insolent and aggressive girls and boys, thickly covered in strong make-up and boldly dressed. He had a street sensibility, there was nothing reserved or prim about it, and he was fascinated by counterculture and the creative creatures that inhabited those worlds and expressed themselves loudly and fearlessly. 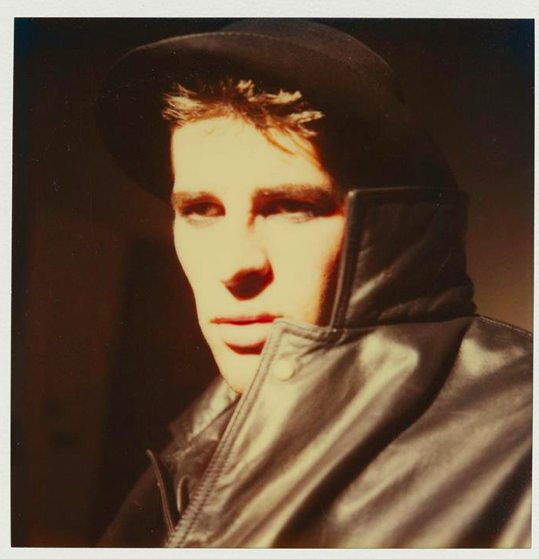 Tony made his the explosive mixture of styles that he picked up in the streets of New York and London: punk, new wave, dandyism and sportswear. When he styled his models the look was tough and sexually charged. Knowing that I was a bit of a country bumpkin he liked to tease me and shock me by talking about his wild student days at FIT and then Parsons and his dangerous and decadent nights at Studio 54. 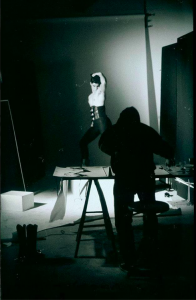 He often spoke of Diana Vreeland as being one of his sources of inspiration, as well as his mentor Antonio Lopez and designer Hanae Mori, the Japanese visionary and fierce business woman. 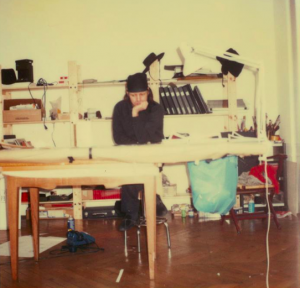 In fact Hanae Mori supported him for those first years in Paris as she was constantly commissioning work for her fashion network around the world….boutiques, advertising campaigns and art direction, Tony did everything for Hanae. That year we got a proposal from a close Mexican pal of mine that Tony could not refuse. Ignacio Garza had a massive apartment in the 7 th arrondissement on Avenue De Saxe which could also double up as a studio. He would exchange it for Tony’s smaller but charming and more affordable flat on the Place de la Contrescarpe, right behind the Pantheon. It was as if we had to turn the page and consider ourselves finally ready to start showing his new portfolio and launch his career. That was it! No turning back any more, it was a terrifying thought but we took the risk. 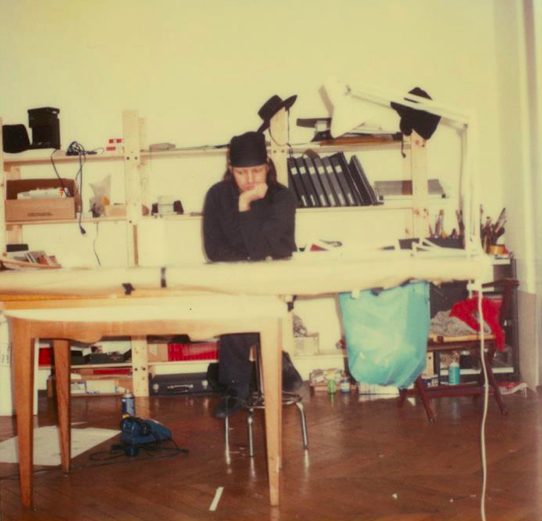 The flat had a big double living room where Tony set up a long work table on a trestle, his back against the wall. Behind him a moodboard that changed every other week with tears from books and magazines, Polaroids and bits and pieces of stuff that inspired him….a thank you note, a post card, an invitation, a weird shopping bag…it all went up on the wall, as well as his collection of black hair pieces, extensions, wigs and hats that he used on his male and female models. 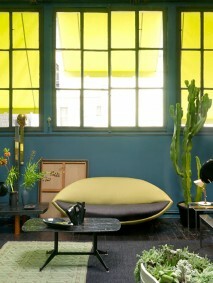 In the second living room, right in front of his table, he installed the apple box he used for the models to pose on. On the table were many big jars full of paint brushes, eyebrow pencils, lipsticks, eye liners, pastels, Rotring pens, Chinese calligraphy brushes, charcoal…..and dozens of bottles of inks. He used the make-up on the paper and on the models alike. 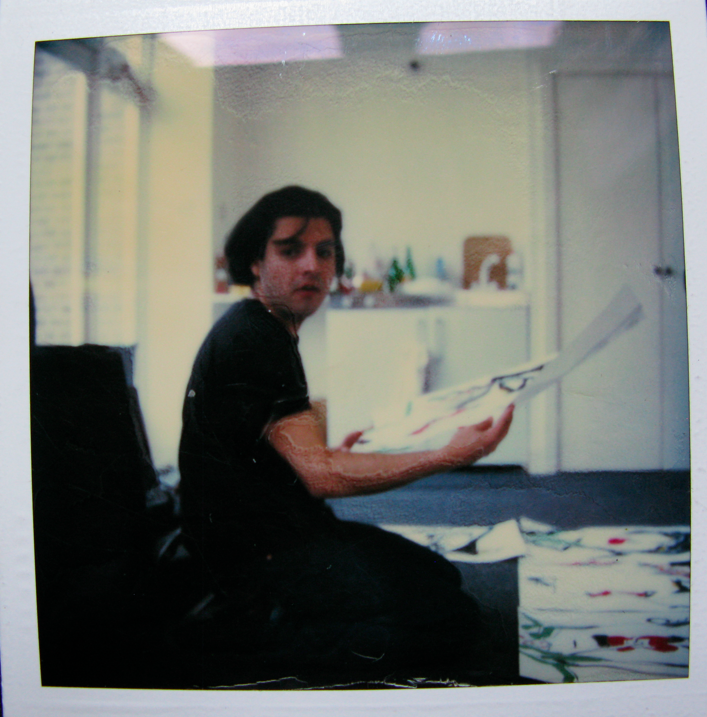 The table was tidied every morning by one of his helpers/models/lovers/squatters and by the end of the day there would be stacks of scrunched up paper, torn Polaroids and black ink stains all over the floor. Tony always played opera music very loudly and would enact the exact poses that he wanted from his models: big open mouths, contorted limbs, extreme poses that became his trademark. To watch him illustrate was electric, he would do dozens of sketches in order to seize that one pose, or the essence of the pose, going as fast as he could, throwing out page after page until he was satisfied. I remember once he was slashing at some paper with a cutter in order to mash it up as an illustrated collage, a technique he later developed when he started taking pictures, when suddenly he sliced off a piece of one of his fingers. He was so caught up in the moment that he did not even realize that the finger was spurting blood everywhere . Eventually I had to turn off the music and shout at him to stop what he was doing and to let me wrap the finger in a towel. We ended up having to go to the emergency room of the hospital which was right down our street to have it properly taken care of and stitched. But the moment Tony moved into that huge place the party also began. And that was not such a great thing in the end. The flat had two bedrooms and 2 bathrooms, plus the work area. Every day I would arrive to find a new guest on the living room floor. Tony bought some mattresses that he stacked in the entrance hallway and they were then spread out at night to accommodate the latest arrivals. It was all pretty tumultuous and promiscuous. You never knew who was his lover or helper or muse or all three. On one occasion he opened the door to a very cute french Fedex delivery boy and asked him for his number. I saw this boy many times after that , delivering during the day and posing at nights. he was also one of Tony’s lovers. Eventually a fantastic studio manager by the name of Paul Hendrix, who was also a top male model and one of Tony’s muses, took over the studio and for a few years there was a semblance of order in the chaos that had become Tony’s life. As soon as Tony’s portfolio felt finished I called my best friend from school, Lucinda Chambers, she had just started working for British Vogue as the assistant to the fashion director and I asked her to take a look at his work. I can really say that we owe a lot to Lucinda for her vision and balls so early in the day and that meeting was followed by a first commission from British Vogue for a short hat story that ran on two pages in their December 1983 edition, the model was Leslie Winer, a punk model and “dub lesbian witch“ who became Tony’s muse and the badass model all the designers and photographers dreamt of working with. 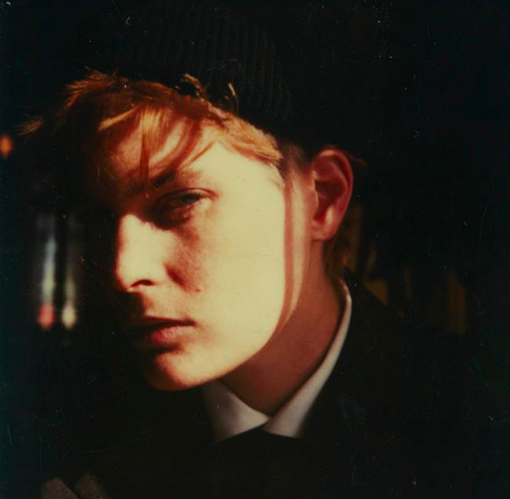 The hats were beautiful, very couture and lady-like so right before the Vogue session Tony shaved off Leslie’s hair and turned her into a mean-looking street urchin, the contrast was stunning and unexpected and that first job for Vogue was to open many doors for us later down the road and subsequently Leslie became fashion’s first really androgynous model. Above: Leslie Winer posing for Tony’s first Vogue assignment. Below: Leslie Winer. 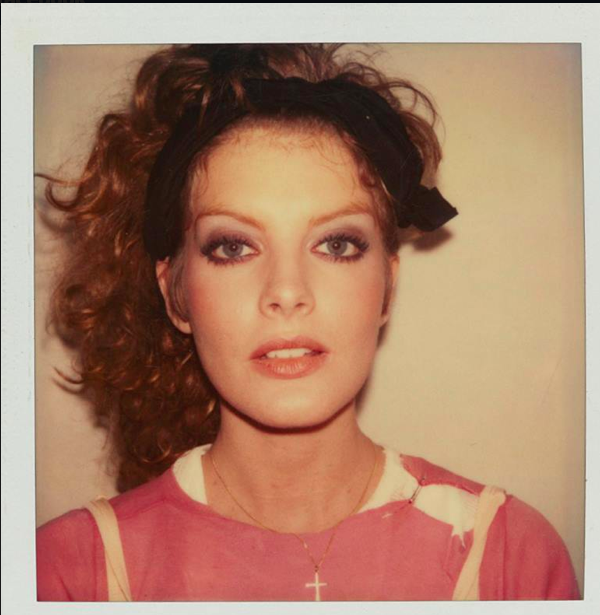 Polaroid by Tony Viramontes. After that job followed another important commission and this time for another friend of mine, Jean Pierre Joly, director of the Woolmark association at the time. Jean Pierre asked Tony to illustrate one important piece from each one of the designers that belonged to the Woolmark group. That job was crucial for us because it gave us instant exposure and recognition, access to fantastic clothes from all the major designers and “createurs,” as well as the contacts we were able to make at each showroom since we were always begging for clothes and accessories to use to build Tony’s portfolio. It was also at around that time that we got our first proper advertising job and consequently got ripped off big time. 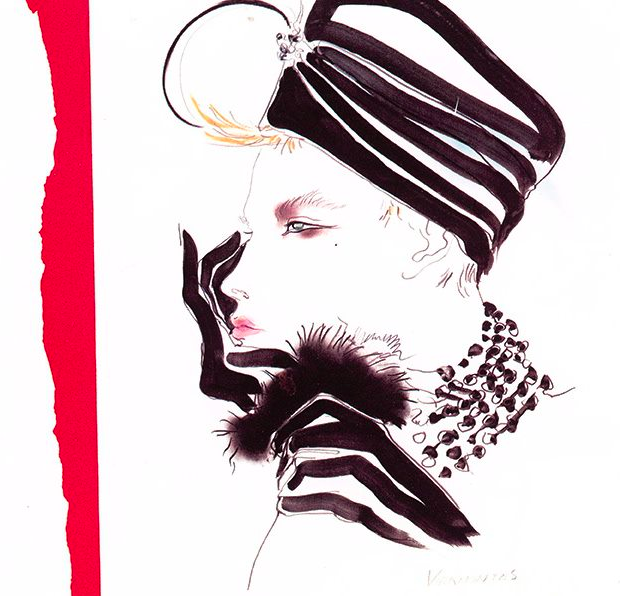 An acquaintance of Tony’s asked him to do an illustrated logo for Le Printemps department stores in Paris, they wanted something very Parisian and quintessential and yet did not want to spend any money so Tony stuck a tricorne on a model, put her in a striped sweater and high heels and drew three variations of what became one of the most iconic fashion logos ever. The only problem was that we were dealing with a sort of a friend of a friend and because we had no contract nor purchase order from anyone, the agency in Paris was able to use that image in perpetuity without paying a usage fee: billboards, pamphlets, bus shelters and on thousands of shopping bags, that image has been everywhere since. That taught me a painful lesson and it was to keep Tony away from any type of deal making and contracts, specially the ones made at 5 am in the morning on the dance floor of Le Sept. Above: Le Printemps logos and campaign by Tony Viramontes. From the archive of Eugenia Melian. Those months in Paris after Tony moved into the new flat were a succession of parties, with his friends and muses flying in from New York and London to crash there. 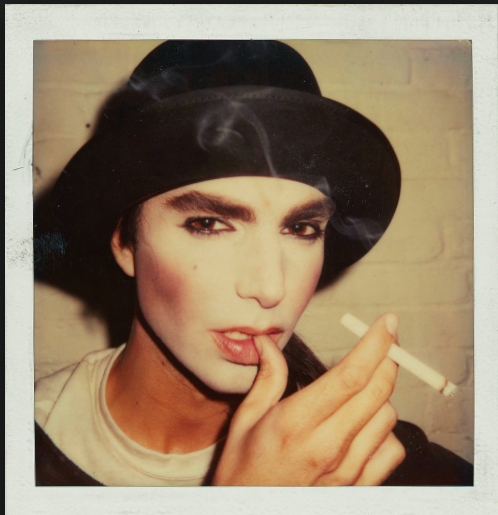 Leslie Winer was a permanent fixture, as was another one of his “jolie laide“ muses Lisabeth Garber; the legendary make-up artist Way Bandy who worked for Scavullo and Penn and then became Nancy Reagan’s make up person and whom Tony was trying to fix up with the edgier designers in Europe in order to forward his career, Matthew Rolston: a young LA celebrity photographer, Steven Meisel, Tony’s teacher at Parson’s and whom Tony naughtily nicknamed Sissy, their muse and stunning boy-girl Teri Toye who went on to win the Elle magazine Girl of The Year modeling price, but was in fact a boy , Sophie De Taillac, Ignacio Garza… All this crowd crashed and partied at Tony’s flat for days on end. I remember Tony telling me to look at Steven Meisel’s portfolio and consider representing him because he desperately needed an agent in Europe. 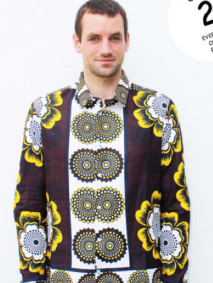 As soon as I took one look at those first fashion editorials of Steven I of course said YES ! but Tony had a jealousy fit and said to me bluntly: “It’s either him or me, but not both.” So I stayed on with Tony. Below: James Breese, Steven Meisel, Teri Toye, Way Bandy, Brad Floyd shot by Tony Viramontes 1983. 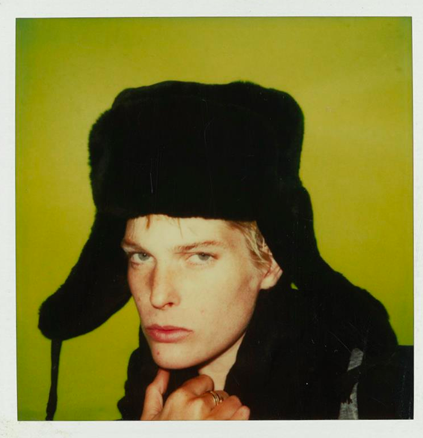 Below: Polaroids of Steven Meisel, Janice Dickinson, Antonis, Paul Hendrix, Mike Hill, Leslie Winer, Eugenia Melián and René Russo. By Tony Viramontes. I thank my lucky stars that I was so broke that I could not afford to go clubbing every night, also I was very sporty and healthy and I did not drink or do drugs. That is what saved me in the end. Unfortunately I cannot say the same of many others that were part of that explosive entourage. By September 1983 all this networking and promoting was giving its fruits and a real buzz had started around him but that same month I was given two weeks to leave France! Spain was not part of the EC yet and my request for a work permit was refused even though I had already spent four years in Paris studying and had a work contract with a company that wanted to hire me on the spot. It turned out for the best since exciting things in the fashion editorial world were then beginning to happen in Milan at the new young edgy Conde Nast magazines that everyone wanted to work for: Lei and Per Lui. 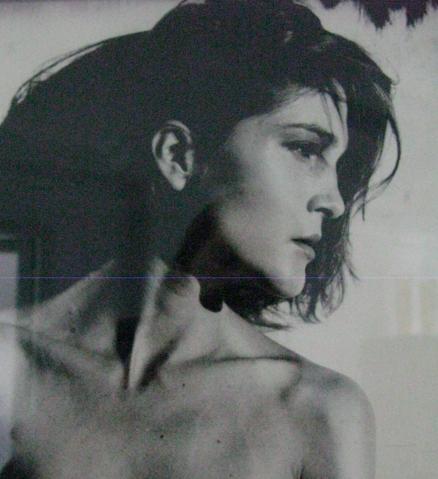 In two weeks I had to drop everything and relocate to Milano and with my then Italian boyfriend we opened a photographer’s agency with Tony as our first client. Very soon after that I met a fantastic pr called Maggie Newman who became our closest friend and took us under her wing. 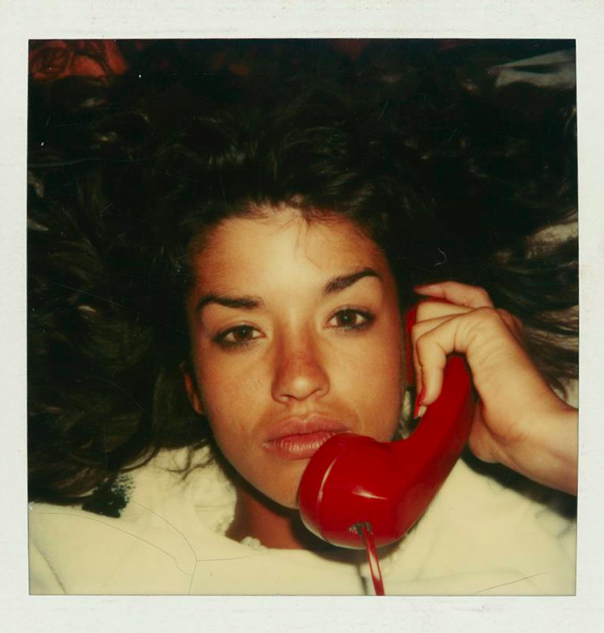 She had one look at Tony’s book, picked up the phone and called one of her clients, Adriano Goldsmith , then owner of the Italian fashion group The Genius Group. Stay tuned for part 3 of this story: the Genius Group campaigns, Valentino, Montana, Lei, Per Lui, Rai Petri and the Buffalos, The Face, Arena, I.D , Nick Kamen, Paul Hendrix, Boy George, Duran Duran, Janet Jackson,Mike Hill, Violeta Sanchez, Cristine Bergstrom, Lisa Rosen, Walter Schupfer, Tina Chow, Paloma Picasso, the first symptoms of his illness and much much more. If you are in Milano right now you must visit Corso Como 10 , where the book Tony Viramontes Bold Beautiful and Damned is being launched. 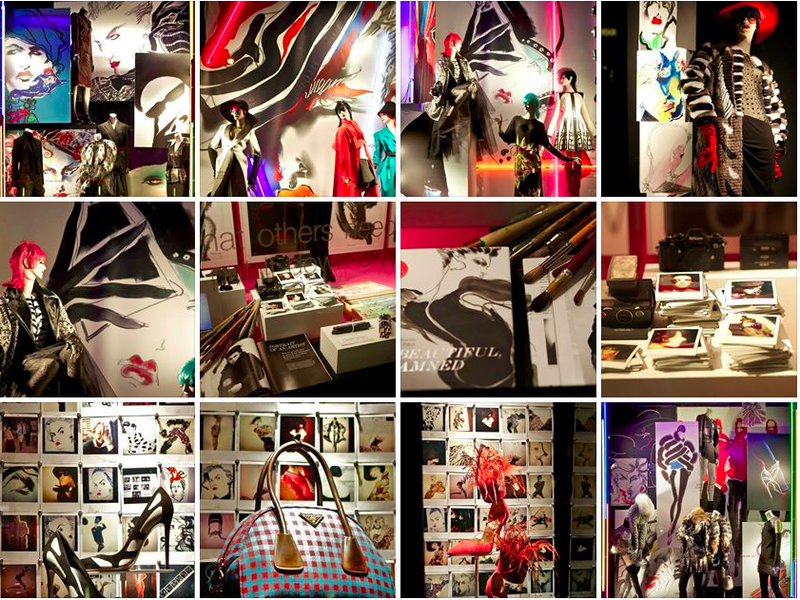 If you are in new York , then do not miss the Bergdorf Goodman windows on Fith avenue, celebrating the publication of Bold, Beautiful And Damned by Dean Rhys-Morgan , see below. Read here PART 3 and the end of the story. Wow Lorelei! so interesting ! Thank you for writing and good luck with your hollywood fashion film…..is it fiction ? Wow… can’t wait until YOUR book comes out. I’ll be getting BBD as well. I got all obsessed about Antonio a couple of years back and bought some illustration books — his and some surveys of illustration as well, so why wasn’t Tony in them I wonder. Maybe he was and I missed it but I don’t think so. I’ve since donated them to my library, so I can’t tell you exactly which ones, but Tony’s illustrations are fantastic. Oh and the current video of the purses with the cat and the flashlight are great. Mross thank you for the encouragement and support ! 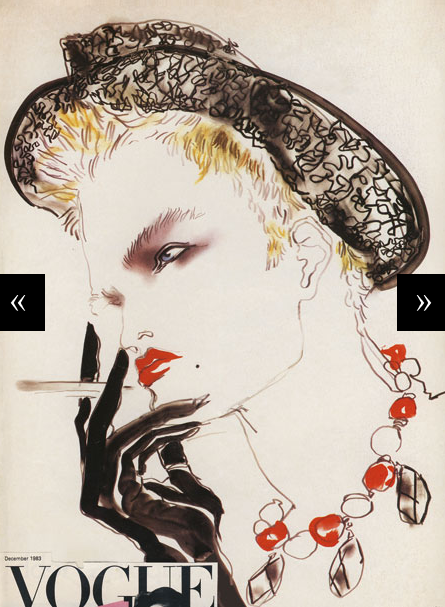 yeah…don’t know why Tony is not part of many books on illustration ….he is fashion illustration history ! . It is true that the work has been stored in sealed boxes in a garage in LA until Dean got them out , so the work was NOT AVAILABLE for the world to see and publish . It is a long story which I cannot go into for legal reasons , but a sad story because Tony could and should have been much more famous now. But the good thing is that now he is finally getting the recognition he deserves……2 and 1/2 decades after he passed away. 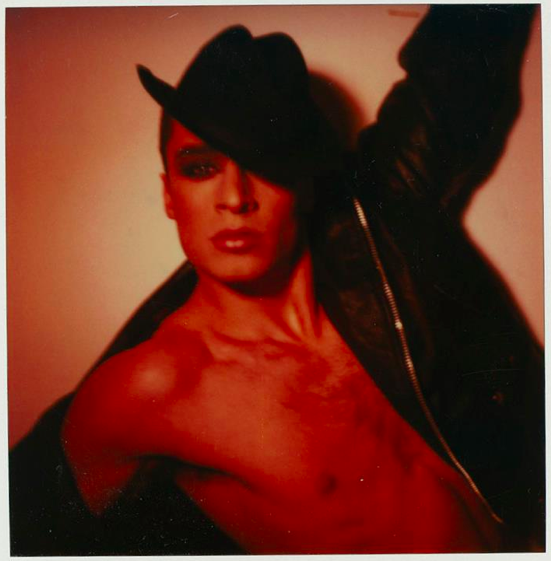 I met Antonio many times, Tony was obsessed with him, Tony had been his teacher in NY and was a kind of mentor to him. Antonio was very imposing and glamorous , always surrounded by his posse of beautiful models. Tony was very inspired by his whole persona and emulated him but also dissed him saying that whole over the top glamorous beauty thing was over . I suppose Tony invented a new type of ugly beauty. And that is also what made him famous. You will LOVE the book…..can’t wait to hear your thoughts on it. what ifs the current video with the cat and the flashlight ? Qué interesante y qué bien escrito! Looking forward for part 3!!!! 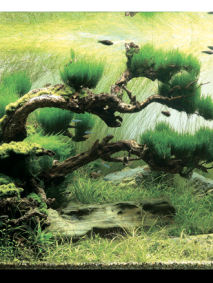 The strange and serene beauty of aquascapes.